The promotion of Windows Vista is getting more intense, more viral with lots of freebies giveaway, generating lots of marketing buzz, and bigger, not only in term of prize for the winners, but also the promotional packaging box of Windows Vista. 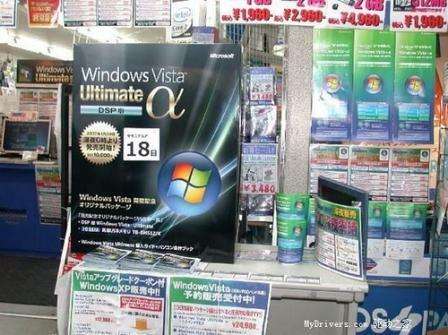 In Japan, distributors and retail shops at Akihabara Electric Town has started the marketing drive and promotion for Windows Vista. Other than free gift U-disk for the launch retail customers, Japanese retailers also make a extra large size packaging box of Windows Vista α DSP edition in order to attract passerby and window shoppers. This retail package box has dimension of 95cm in height, 75cm in width and 25 cm in length. 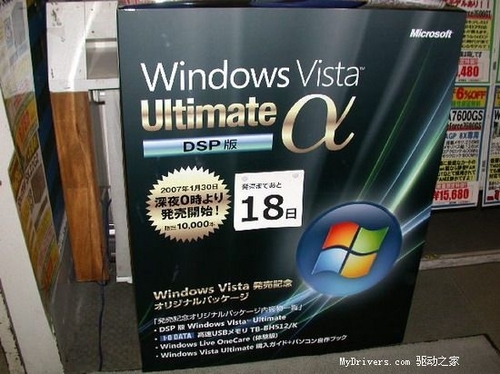 Windows Vista Ultimate α DSP edition seems like only available in Japan and is a limited edition retail release. 32bit and 64-bit of Windows Vista Ultimate α DSP edition both selling for the price of 24980 Yen, about $206.752 USD. DSP which means Delivery Service Partner is the edition that similar to OEM edition, but distributed by smaller system builders and must be purchased together with another computer components.